The Scientific Industries Genie Microplate Mixer provides analog control, variable speed mixing for a standard microplate format. This vortexer has a speed range between 750-3200 RPM, and an orbit of 1 mm, allowing for gentle to aggressive agitation and mixing no matter the viscosity of the sample. 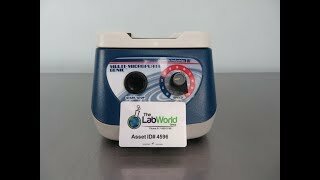 This microplate vortex mixer can be used in a cold room or incubator and has a timer function between 1-60 minutes. This Scientific Industries Genie Microplate Mixer SI-0400 has been fully inspected and is performing to expectations. All of our lab equipment comes backed with our standard warranty. Should you have any questions, please don't hesitate to contact us.